Coming together and moving apart many times, changing properties each time. Until they are One. Destiny. Hesitation, fear, worry, regret – worrying and regretting natural cycles of time – ?lifetimes. 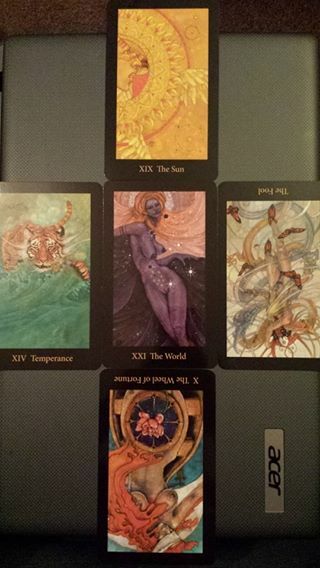 Card 1/Defense shows me it is natural and meant to be, nothing to worry about, just a progression of natural cycles. Immediately I see the judge knows the Truth, it is deep within and beyond several lifetimes yet the judge can also look to the human side of impatience and fretting and understands – to me the Sun can simultaneously live in both worlds/knowledge. Not handling chaos as well as should be – so taking on 1,2 & 3 and accepting and trusting in this Truth I will find I can accept and understand chaos with grace and revel in it. Be at One with it all. It is forever changing and is ultimately perfection. There is no good or evil, it is what it is. Survive turbulence but marvel in perfection and diversity. The whole, completeness and success. Fulfillment. The playing field of life.Exploring who I am and what I am part of.